Lincolnshire Printing is a manufacturer of printed forms you see everyday in many different environments: Healthcare (Health Risk Appraisals); Gaming forms and systems for the gambling industry (tracking high rollers, keno, etc. ); forms and systems for various sport score collecting and computations (tournaments, averages, handicaps, etc.). 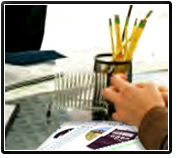 We also provide forms for the Trucking industry (Driver log books, scannable inspection sheets); Education (standardized testing and scoring); Government (ballots, voting sheets, and cards); and in industries where the ability to quickly gather information for research analysis are vital to their marketing research.